Today's post is a 2 in 1. I know I kinda skipped the August favourites but it's been mainly because of the fact that I was ill back home and then we left for Thailand. So not a lot of products used to be honest. But in this post I'm gonna show you the products I've brought with me to Asia and tell you a little bit about my makeup routine here. 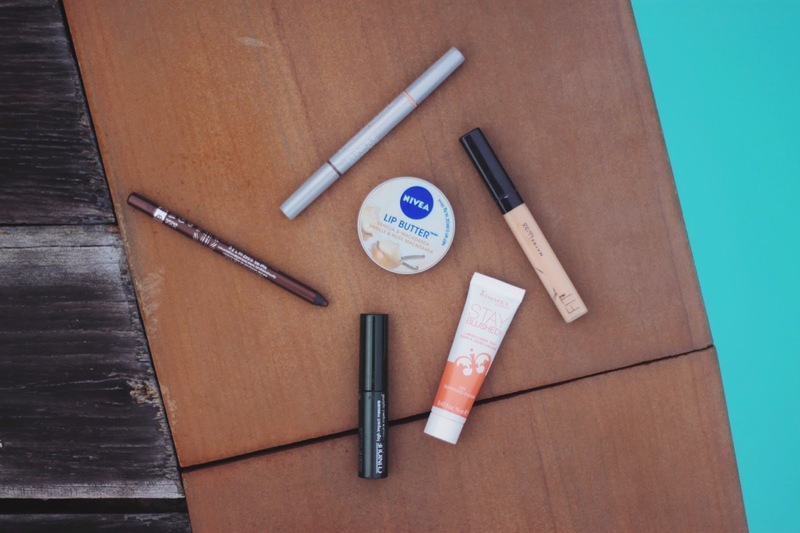 I've brought 5 makeup related things with me (plus a lip butter): Rimmel Stay Blushed! Blush in the shade Cherry Me, which is really nice natural looking blush which looks great with tan (and it's also cream/mousse formula so it applies really easily); Rimmel Scandaleyes Kohl Kajal, the brown one - a multi-purpose product because I can use it to tight-line & also to apply it onto the lid and just smudge with my fingers (oh and the staying power is really nice); Clinique High Impact Mascara which is now one of my favourites (and funny enough I don't own any waterproof one, hmm); Clinique Brow Pencil, just in case I'm interested in having brows again lol and lastly the Maybelline Fit Me Concealer for the after-party days. But let's face it I rarely use any of it (ok I wore the mascara twice). I'm totally makeup-free in here and I love it to be honest. It's nice to take a break from time to time. And my freckles are happy as well. what is yours makeup routine at the moment? Dnešní post je tak trochu 2 v 1. Vím, že jsem vynechala oblíbence za srpen (především kvůli tomu, že jsem nejdřív hrozně pracovala, pak byla nemocná a poslední týden už jsme odjížděli do Thajska). Takže jsem vlastně skoro žádné produkty nepoužívala. Dneska Vám ale ukážu věci, které jsem si s sebou vzala a povím Vám o mé makeup rutině tady. jaká je Vaše nynější makeup routine? oh and this happened. I got freckles on my lips for the very first time.